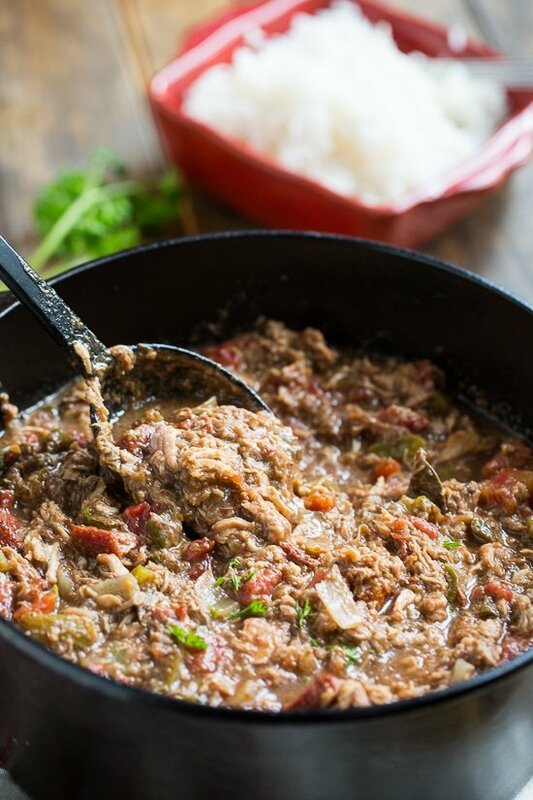 Pulled Pork and Tasso Gumbo is loaded with meat and is a great way to use up leftover pulled pork. Have some leftover pulled pork? Why not make gumbo with it. 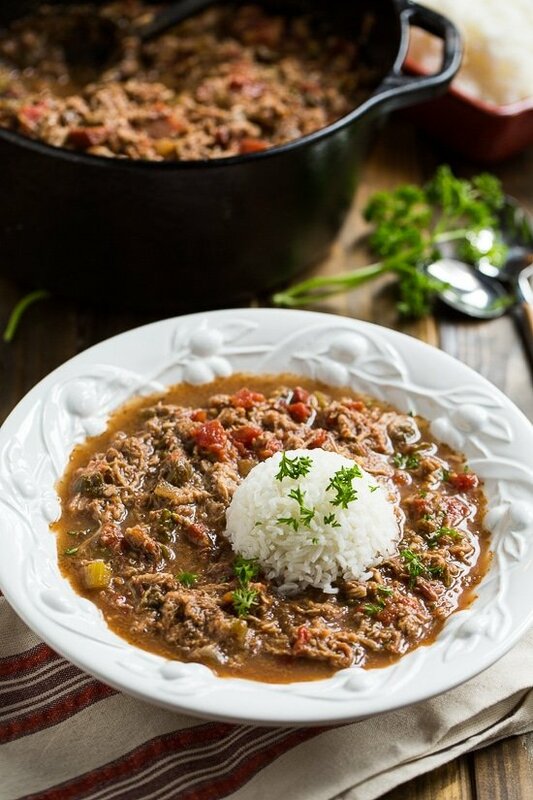 With Mardi Gras right around the corner, I am in the mood for all things related to New Orleans and this Pulled Pork and Tasso Gumbo really fits the bill. Only with a little twist. 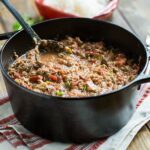 Some jalapeno, poblano, and dried red chili peppers give this gumbo a little southwestern flair. And plenty of heat. 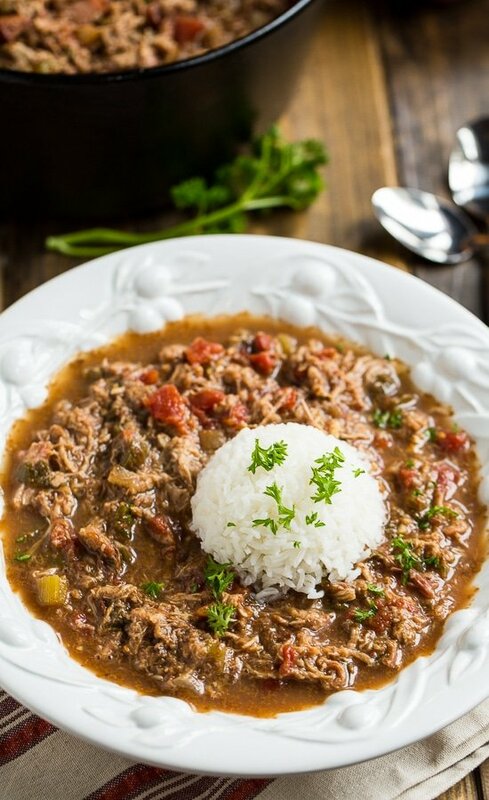 There’s a whole lot of meat in this gumbo, making it almost more of a stew. In addition to pulled pork there is also tasso ham, one of my favorite ingredients that’s frequently used in Cajun food. Tasso ham can be hard to find. There’s only one specialty food store in the Charlotte area (Reid’s) that I know of that carries it. If you want to try it your best bet is to order it online. You can also find recipes online for making your own tasso ham. Tasso Ham is made from lean pork which has been marinated, seasoned, and smoked and it is typically quite spicy. It can enhance the flavor of many different foods including pasta dishes, jambalaya, soups, and sauces. And of course gumbo. The key to a super flavorful gumbo is the roux. Be sure to take your time with it. If the heat is too high, it will burn. It’s best to use a Cast-Iron Dutch Oven or a pot with a heavy bottom. To make a roux, whisk together oil and flour in a large heavy saucepan (cast iron is perfect, but any heavy-bottomed pot or pan will do) over medium to medium-low heat. Once combined, it is easier to use a wooden spoon to stir. Stir continuously for at least 20 minutes, until mixture turns a dark caramel color. It should darken very slowly. If it darkens too fast, turn down the heat. The roux will burn if the heat is too high or you don't stir continuously. Be sure to really stir all the way up to the edges of the pot. You don't want any of the mixture to stay in one spot for too long. Add onions, peppers, celery, jalapeno, and garlic. Cook, stirring frequently, until vegetables are tender, about 5 minutes. Add tomatoes, broth, bay leaves, dried chili peppers, Cajun seasoning, salt and pepper. Bring to a boil. Reduce heat and simmer 25 minutes. Meanwhile brown tasso ham in a pan using 2 tablespoons of vegetable oil. Add pulled pork and tasso ham and simmer 5 more minutes. Check for seasoning and add more salt if needed. Remove and discard bay leaves and dried chili peppers. 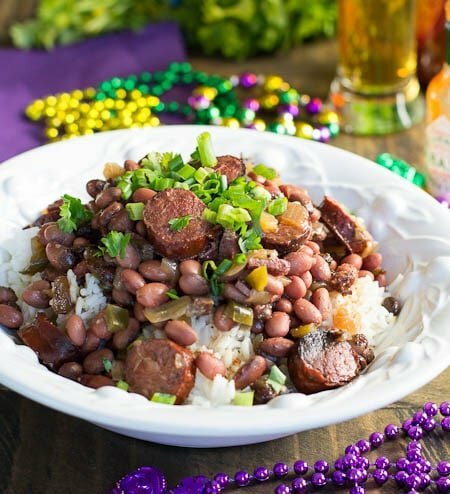 Serve gumbo in bowls with rice. 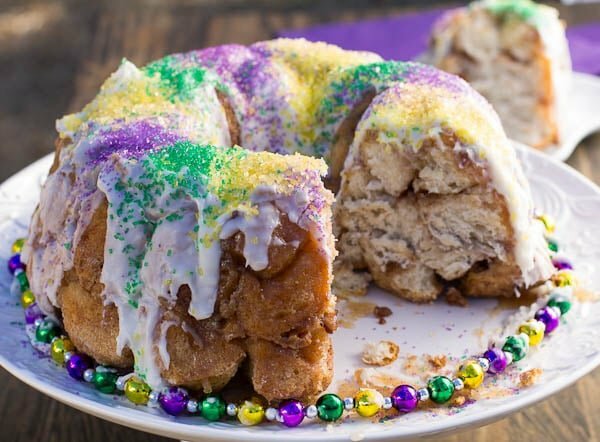 This entry was posted in Main Dishes, Pork, Soups and Stews and tagged Cajun, gumbo, New Orleans, Pork. Bookmark the permalink. Please stop calling these Frankenstein dishes gumbo. And FWIW – Once a Cajun sees you put tomatoes in a “gumbo”, you will immediately be laughed out of the kitchen. Call this a soup, and leave Louisiana far, far away from this. My of my! When I lived in Louisiana I remembered people having better manners. This is a great dish! We dubbed it Hoosier Gumbo because of the pork addition. My only comment would be to make sure celery is tender in step 1 before moving on. I didn’t check, and it kept a little crunch. Please don’t call this gumbo!!!! Pork does not go in gumbo other than in sausage!!! And also it is not “tasso ham” it’s called tasso!!! The ham is of the Hind leg of the pig..
“Tasso” is made of the front shoulder witch is a much more used muscle so it has much more flavor!!! Umm wow. This looks incredible! Pinned! Totally delicious! I wouldn’t have thought to add pulled pork to gumbo! Such a smart idea! Lots of flavor going on here! This is a dish that would a huge hit at home with my boys especially with the rice. I also need to check out your red bean and rice recipe- good stuff! 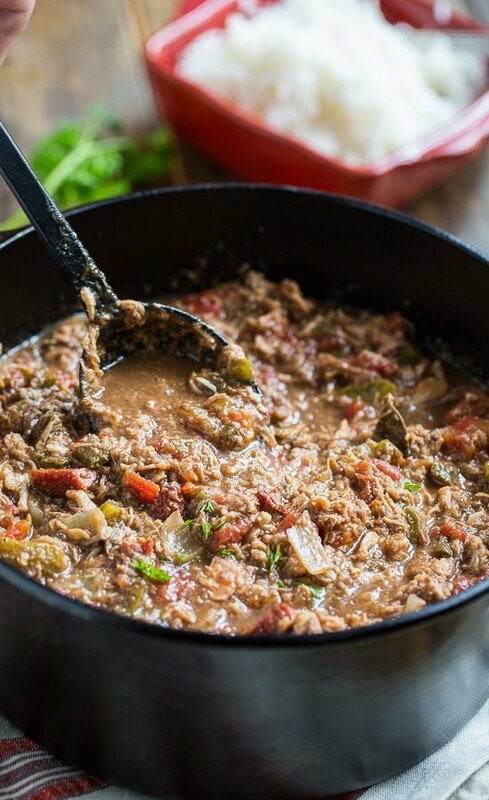 This gumbo looks incredible and so full of flavor! I love the heat from the jalapenos and red chili peppers! It’s so cold here and a big bowl of this would definitely warm me up! This gumbo looks delicious, Christin! I’ve never had tasso ham before, but it sounds like the perfect compliment to the pork. 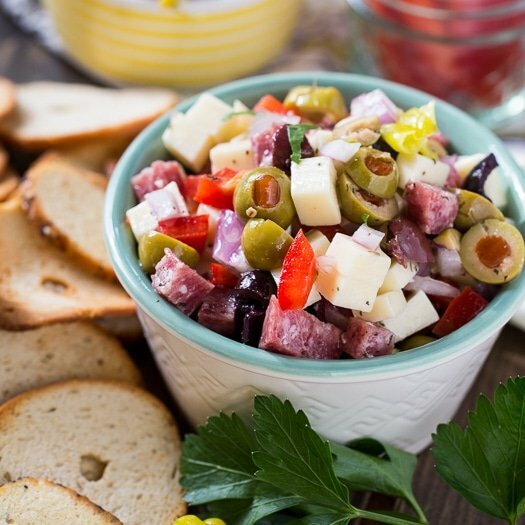 Love this flavorful dish!